Pasta Cabonara recipes seem to be hit and miss for me, as I find many of them simply too rich. This seemed like a nice change though, so I thought I'd give it a shot. 1 clove garlic, peeled BUT NOT CHOPPED!!! Boil spaghetti according to directions on package. Cut the bacon into pieces. Put them in a skillet and season with chilli according to taste. Cook for 2 minutes, until fat begins to render. Add the whole clove of garlic and cook another 5 minutes until the edges of bacon just begin to get crisp. Do not overcook. Meanwhile, break the eggs into the bowl you will serve the pasta ind and beat them with a fork. Add some grindings of pepper. Remove the garlic from the bacon pan. When it's cooked, drain the pasta and immediately throw it into the beaten eggs. Mix thoroughly. 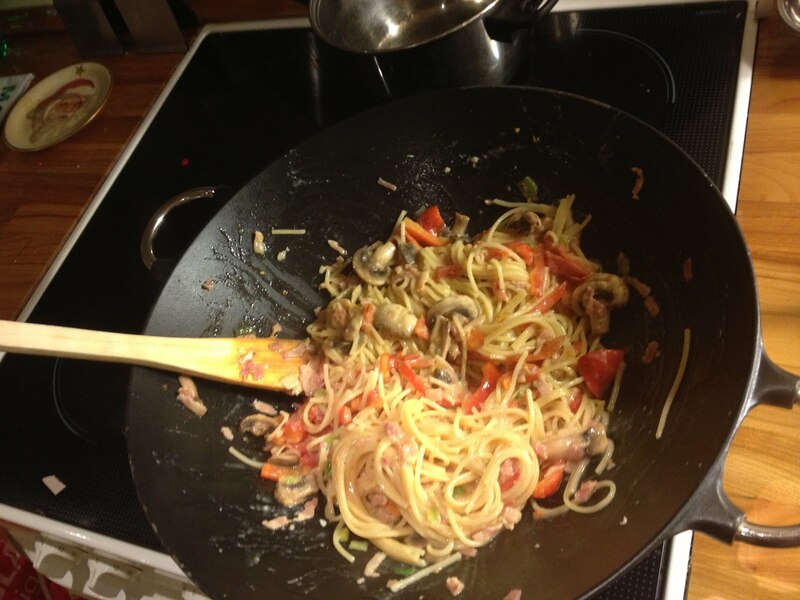 The heat of the spaghetti will cook the eggs and turn them into a sauce. Add the bacon with its fat, toss again, add cheese and serve. I'm glad I gave this a chance, because it was very good! The egg/pasta ratio and lack of added milk made for a less rich sauce than I'm used to, which is definitely a good thing. There was slightly too much bacon though (I know, I know, that's an oxymoron), so I think I may limit myself to 75g next time.